One of the most important parts of planning any road trip in Nova Scotia is deciding where to stay the night. I’ve written about some of the best places to stay in Nova Scotia, which focused primarily on homes and cottages to rent across the province—but during the right seasons, and weather permitting, there’s nothing quite like sleeping in the fresh air under the stars. There are so many incredible places to camp in Nova Scotia, and if you have the gear and willingness, it can make more frequent weekend or staycation adventures much more economical. 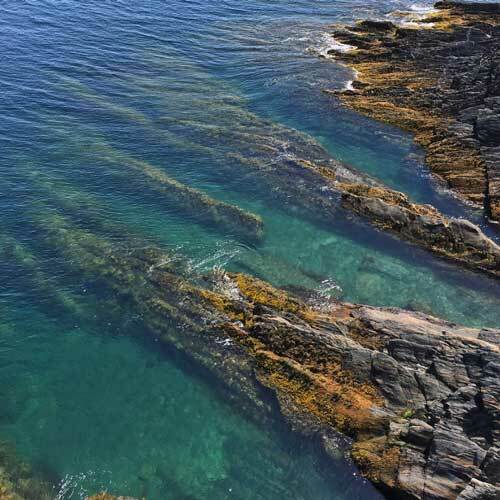 While this list only scratches the surface of places to camp in Nova Scotia, it features my favourite spots—each for their own reasons—and some of the awesome things to do nearby. Five Islands Provincial Park features a campground with campsites overlooking the Bay of Fundy and the islands for which the park is named. If you choose your campsite strategically (read: choose the ones closest to the edge of the park, facing the water) you’ll be rewarded by an incredible panoramic look-off and a stunning view of the sunset. The one trade-off is that the campsites are quite open, so there is not much privacy between sites. Some are better than others, but for the most part, there are no trees or bushes between sites. We’ve only done drive-in sites, but there are a few walk-in sites facing the water that would likely offer more privacy as not as many people tend to use them. It isn’t a huge walking distance from where you’d park, so if you’ve packed lightly or strategically and prefer more privacy, one of those could be a better bet. 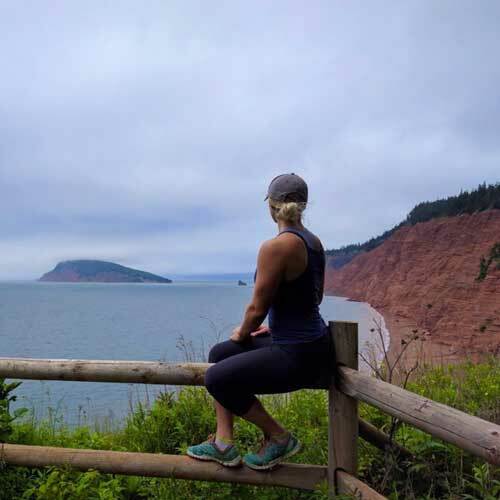 Redhead Hiking Trail — This trail is part of the park and features a walk through the woods which leading to a look off, offering a spanning view of the park’s red cliffs and the islands in the distance. Multi-colour sea cliffs at Five Islands — Also part of the park is a stretch of beach which eventually leads to Five Islands’ multi-coloured cliffs. You’ll have to time a visit with low tide and be careful of rising tides so you don’t get stuck. Hidden Falls — My favourite waterfall in Nova Scotia is only a short drive and walk away from the park. Read more in my Waterfalls of Nova Scotia post. Economy Falls — Another beautiful waterfall is a short drive from the park. Read more in my Waterfalls of Nova Scotia post. Eatonville Day Use Trails at Cape Chignecto — This isn’t super close to Five Islands, but if you were making a weekend out of your stay in the area, you could dedicate a day to visiting the Eatonville Day Use Trails. The trails at Eatonville are well worth the drive to get to, featuring 5.5km of hiking trails which lead to several spectacular look offs to the Bay of Fundy and Three Sisters rock formations. Note these trails are not connected to the main part of Cape Chignecto. 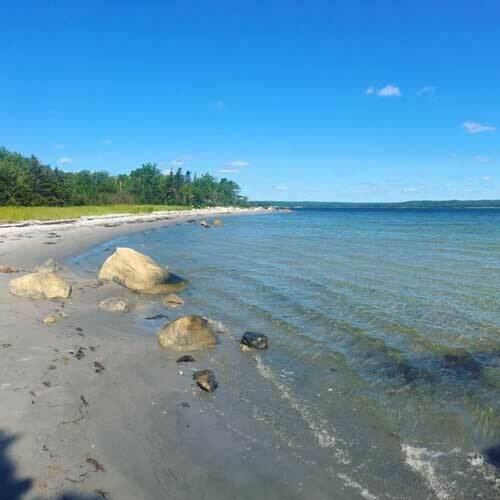 The Ovens is a privately owned campground featuring a variety of campsite options—many of which are right on the ocean and feature great privacy. The last time I stayed here, our campsite was tucked away in the woods but featured access to the rocks by the water where we were able to watch the sunset and had incredible visibility of the stars at night. The Ovens Hiking Trail — The campground has constructed a trail which follows the coastline. It features lots of infrastructure which enables you to see the ovens—or the caves carved into the rock by the ocean—up close. Gaff Point — Close to The Ovens is Gaff Point, a hiking trail which starts at Hirtle’s Beach and then takes you around a small peninsula. Highlights of the Gaff Point trail include its coastal views and access to a Secret Beach on one side. Further down Nova Scotia’s south shore is Thomas Raddall Provincial Park. We’ve camped here primarily during September, which seems to be a great time to stay because the park is quieter and the weather is still great. The campsites at this park are among the most private of the drive-in sites we’ve stayed at in Nova Scotia. Most campsites here are completely surrounded by trees and greenery. The park is located on stretches of white sand beach—so while the campsites themselves are tucked into the woods, in most spots, you’re just a short hike or drive away from a gorgeous beach. Trails & Beaches at Thomas Raddall — You can—and should—spend a full day simply exploring the park’s 11km of interconnected trails and its beaches. Stretches of white sand meet shallow, crystal clear water which reflects the blue of the sky on a sunny day. Keep your eyes peeled for herds of seals posted up on rocks in the distance and piping plovers dancing on the shoreline (P.S. piping plovers are endangered, so be sure to respect their nesting areas). Kejimkujic Seaside — A short drive away from the park is Kejimkujic Seaside, which features two trails which interconnect—the Harbour Rocks Trail which is a ~5km return from the parking lot and the Port Joli Head trail which is a ~9km return from the parking lot. The trails here are well defined and there is some infrastructure like viewing platforms and the classic red adirondacks featured in Canada’s provincial parks. The highlight of this area is the silver sand and turquoise waters of the beach located here. Watch for seabirds and seals in the distance! Fondly referred to as Keji by many of its visitors, Kejimkujic National Park is located inland on the south of Nova Scotia. Keji is a historic and cultural site where Mi’kmaw people lived for thousands of years, and the park is home to over 500 petroglyphs. 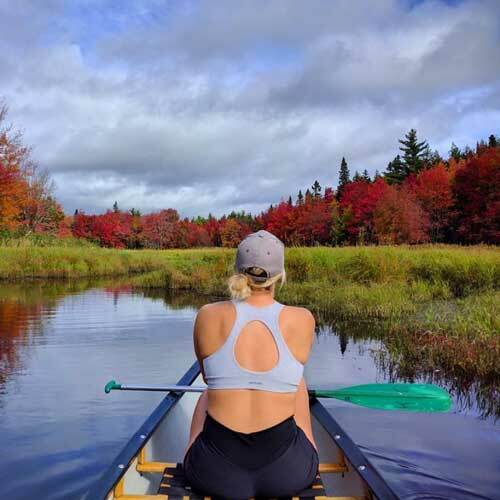 In addition to offering a variety of drive-in camping options for tents, campers, and a selection of roofed accommodations (oTENTiks, yurts and cabins), Keji is well known for its backcountry camping where you can paddle, hike, or bike into your campsite. It’s among the province’s most popular campgrounds and is usually busy throughout the entire May-October camping season. If you want to stay here, be sure to plan ahead (reservations open for the year in January), and unless you’re doing backcountry camping, expect to not have a lot in the way of privacy at a drive-in site. That said, sacrificing a little privacy for everything else Keji has to offer is an easy decision. The park is home to Kejimkujic Lake, the second largest freshwater lake in the province, as well as over a dozen hiking trails. Last but not least, Keji is Nova Scotia’s only designated dark sky preserve–which means that on a clear night, it’s one of the best places in the province to see the stars. Renting a canoe for the day – Canoes and kayaks are available for rent through Whynot Adventure at Jake’s Landing. When Brett and I visit Keji, we’ll rent a canoe for the day and spend the whole day exploring Keji Lake and the Mersey River. The Mersey River is a nice, easy paddle, so makes for a great a warm up. It’s incredibly scenic, and the last few years we’ve been has been in early October when the leaves are changing. The reflection of the changing leaves on the water on a still day is simply breathtaking. For a bigger adventure, head out to the lake and explore. There are many little islands to stop at and different parts of the park you can access by boat, so bring a picnic lunch and spend an afternoon paddling around. Even when the park is busy, the lake is so big that you’ll feel completely immersed in wilderness. One word of advice: be sure to watch the wind if you plan to explore the lake by canoe, and know your limits physically and skill-wise. High winds on the lake can make paddling extremely difficult and potentially dangerous. Visiting Mill Falls — Mill Falls, located on the Mersey River, is on my list of Nova Scotia waterfalls to explore and it’s well worth a visit if you’re in Keji. There are trails on either side of the Mersey River, so you can make it more of a hike by exploring the Beech Grove trail on the other side. As of February 2019, I read on their website that the floating bridge which connects the two paths is under repair so is closed until further notice. Be sure to check ahead so you can plan accordingly. Hiking the Hardwoods and Hemlocks Trail — This 5km trail through the woods takes you to some of the oldest trees in the province, including 300 year old hemlocks. Hiking the Snake Lake Trail — This 3km return, figure eight loop offers beautiful perspectives of the lakeshores at Snake Lake and Keji Lake. There are so many incredible places to camp in Nova Scotia, but these are some of my favourites, and now you know why. Where are your favourite places to camp in Nova Scotia? Let me know in the comments!